The GeoCapabilities approach enables Future 3 curriculum. This means that teachers develop powerful disciplinary knowledge (PDK) with their students. This is not a matter of simply ‘delivering’ a selection of facts. Rather, the teacher aims to create a ‘curriculum of engagement’ with ideas, enabling students to think and to see the world differently. Or, as the Geographical Association has argued ‘to travel with a different view’. Curriculum making is teaching with purpose. Curriculum making is (arguably) an ‘anglo-saxon’ version of what central and north Europeans refer to as subject didactics. Subject didactics explores the teaching and learning of specific school subjects. 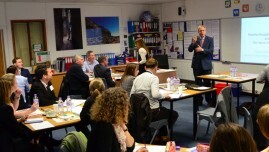 The key idea is that students and teachers both interact with specialist subject knowledge. However, they do so from entirely different perspectives. The teacher’s responsibility is to ‘recontextualise’ the specialist discipline for students. In GeoCapabilities, the challenge of ‘recontextualisation’ is understood to be a central part of teachers’ professionalism. It takes practical form through curriculum making. What curriculum making is not! Professor Simon Catling has traced the use of the term ‘curriculum making’ to the early twentieth century. Curriculum making is an evolving idea. However it is clear that it is not curriculum design. Nor is it quite the same as curriculum development or curriculum planning. Curriculum design, planning and development need not involve teachers at all! Curriculum making is what teachers do. So, why not call it lesson planning? Lesson plans are usually highly specific. They describe particular materials or learning resources and often focus on particular learning objectives, or competences, achievable within a short period. Curriculum making is also a practical matter. It includes lesson planning, but it takes a longer view. Lessons may have objectives, but the curriculum is guided by longer term aims or goals. In England, curriculum making became part of the Geographical Association’s ‘Action Plan for Geography’ project. The GA provides some useful definitions. Curriculum making is understood to be the creative and imaginative work that teachers do to enact an official curriculum plan. Curriculum making provides overarching purpose and direction to lesson plans. 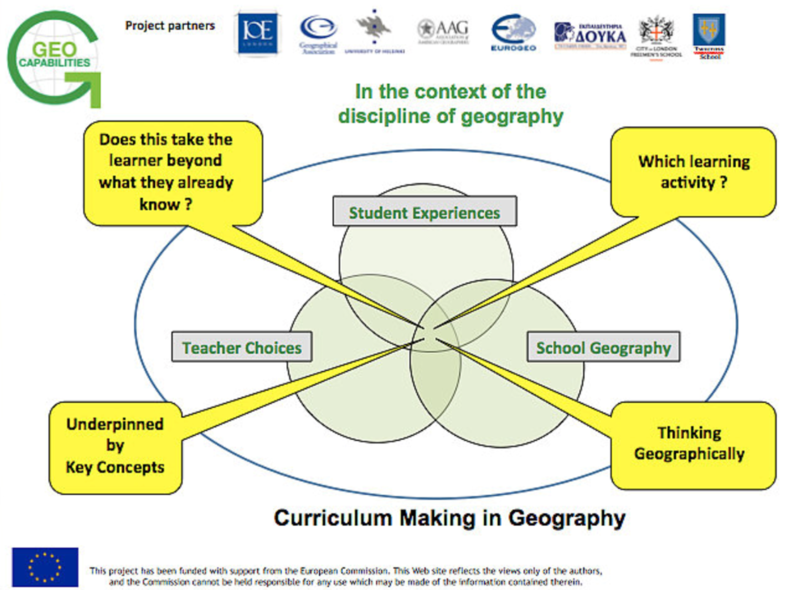 The GeoCapabilities approach sees curriculum making as the key to creating a Future 3 curriculum. A Future 3 curriculum is a curriculum of engagement that introduces all students to powerful disciplinary knowledge (PDK). This enables them to think geographically. Curriculum making is summarised in this diagram. The three priorities shown by the circles can also be thought of as the principle sources of ‘energy’ in any geography classroom. Teachers seek to hold these priorities in balance. This is very skilful work. GeoCapabilities has been funded with support from the European Commission. This Web site reflects the views only of the authors, and the Commission cannot be held responsible for any use which may be made of the information contained therein.